We have recently posted a series of articles against the idea of a “revolutionary” government, against the idea of government or the State as an instrument of anti-capitalist reform or radical change. We believe that in whatever guise, the State can never be a medium for the creation of autonomous forms of life. The overwhelming testimony of historical events is reproduced daily, in the repeated failure of “social-democratic” projects (Syriza, Podemos and their like), as well as the frontal attack on autonomous community projects (most recently and emblematically, the Notre-Dame-des-Landes ZAD in france). 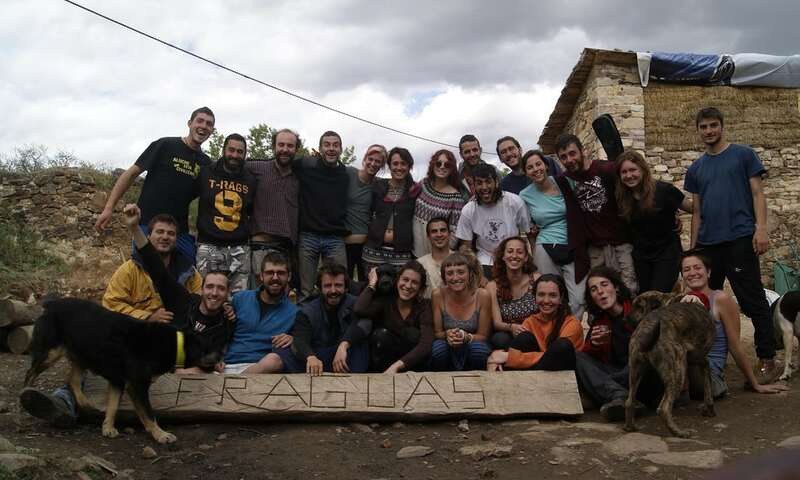 This last Friday, members of the rural community of Fraguas, on the outskirts of Madrid, were condemned for the unlawful occupation of an abandoned village. “A group of young settlers arrived in 2013 and began bringing the village back to life with the blessing of its former inhabitants. Over the past five years, they have rebuilt houses, planted vegetables and worked to restore the overgrown village cemetery. Their activities have been opposed by the regional government, which points out that Fraguas lies in public woodland within the Sierra Norte natural park and argues that their presence is a fire hazard. Castilla-La Mancha’s high court ruled on Friday that the collective had unlawfully occupied the site and sentenced six of its members to 18 months’ imprisonment. They were also fined €2,700 (£2,370) each and ordered to reimburse the regional government for the cost of demolishing the newly restored areas of Fraguas. Although the sentences could be served on probation as they are under the two-year threshold, the court said failure to pay the fines would result in a three-year sentence. Jaime Merino, a spokesman for the collective, described the sentences as devastating and said an appeal would be launched. Despite the intervention of local environmentalists, who have been acting as negotiators – and a petition with more than 77,000 signatures in support of the project – the collective now believes prison is inevitable. Merino said the six did not have the money to pay the fines. “Anyway, it’s not just the fines we have to pay, it’s the cost of the demolition, which will be decided by the regional government,” he said. “If we don’t have the money for the fines and the demolition, they’ll translate the fines into prison time, which will increase the sentence and we’ll end up in jail. To oppose autonomous forms of life against State rule is what cannot be tolerated. Numerous such rural spaces exist in spain (and elsewhere, in multiple forms), along with urban free zones in the form of occupied social centres, urban gardens, work and exchange collectives, all of which are spaces of opacity for State rule; and thus all must be confined or wiped away, for fear of contagion. If autonomy is to be more than an empty fantasy, then it exists through such spaces, outside and/or against capitalist State rule. For they put into question notions of private property, political representation (in whatever form), global economies of extraction and provide a wealth of experiences in collective, autonomous life. This entry was posted in Commentary, News blog and tagged autonomy, Fraguas, Occupy the Land, spain. Bookmark the permalink. Pingback: In solidarity: #Fraguas and the creation of community – Enough is Enough!